or are you foreign to everything you love? your coat and what do you want to drink? in a language you haven’t used in years. oder bist du exotisch für alles, was du liebst? zieh deinen Mantel aus und was willst du trinken? in einer Sprache, die du seit Jahren nicht benutzt hast. 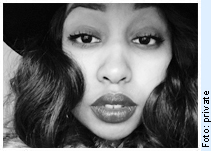 Warsan Shire was born in 1988 in Kenya to Somali parents, she grew up in London, where she still lives. She won her first prize at an international slam event and is now the editor of the magazines Literary arts mashup and Spook. She leads workshops, in which poetry is used as a tool to try to overcome personal traumas. Her poems have been published and featured in various literary publications, such as the Poetry Review, Magma and Wasafiri as well as have been featured in the collections Book of Younger Poets (Salt, 2011) and Ten: The New Wave (Bloodaxe, 2014). Poems of her have been translated into Italian, Spanish, Portuguese, Swedish, Danish and Estonian etc.